Day 3 When I started this project I had no design sketched out, no road map, no defined direction. 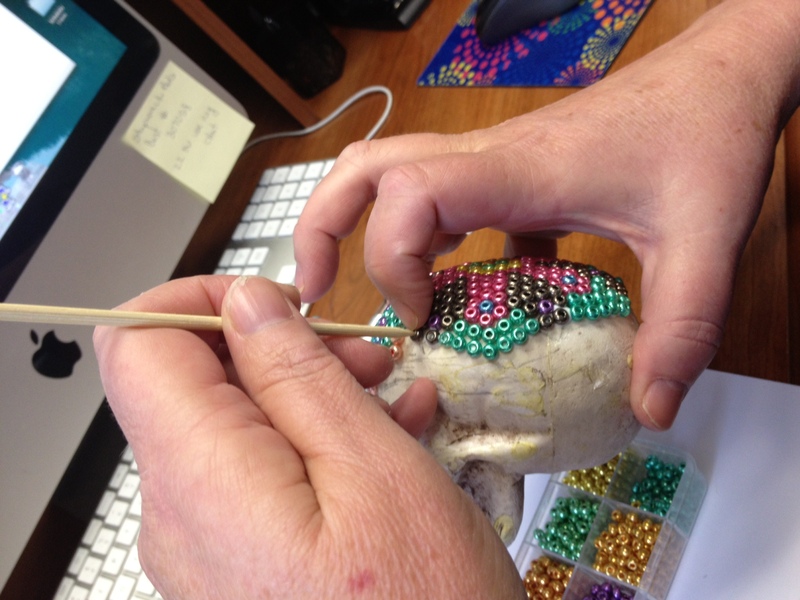 My goal was to take pretty beads and glue them on this crazy skull. 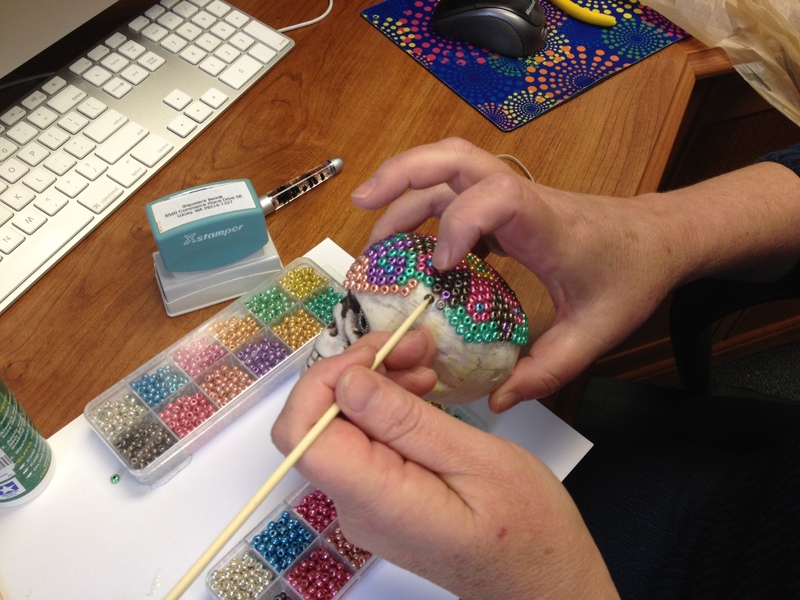 I stared with one orange bead in the center of the skull and started going round and round in circles. I ended my last session and post with a skull that appeared to be wearing a ball cap that was way to small. I have to admit that when I started on the forehead area I kind of lost what little vision I had and kind of froze. Today when I sat down I decided to take a pencil and draw some outlines of the direction I would like to go. After placing a few beads I tossed that idea out completely and just started adding my beads. Round and round and round. A little voice inside asked me why I was not starting on the face. “the face, the face – give this ugly mug a beady face” For some reason I have been hesitant to start on the face. Afraid of commitment probably, what if it looked terrible? But wait, he started out looking terrible could I really make him look more ugly? I took a deep breath and started on the creepy guys face. Now he looks like he has aviator glasses on. Pretty cool. I have included a few pictures of my process. As you can see I have to hold the skull in my right hand and use the index finger of my right hand to position the sticky bead. If it looks awkward and freaky it is because I am left handed. Do not try to do too much in one sitting. The curves are getting more pronounced and the bead slippage factor is increasing. 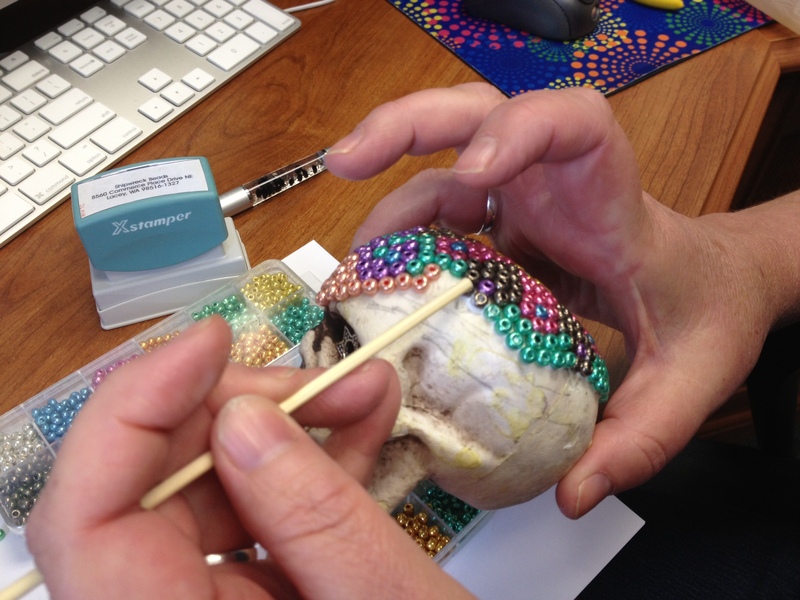 I would work one side of the skull only to find the other side (which had not yet dried) had slipped. I am considering working with a hair dryer or embossing gun to see if I can speed up the drying process. 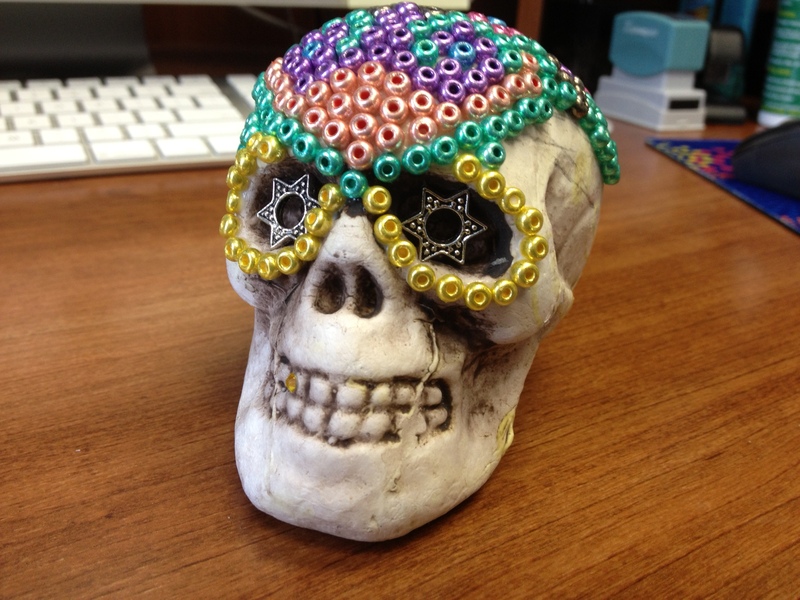 Friday is the deadline for the Sugar Skull Design Contest. Don’t miss your chance to win a $250 gift card to the store!